any news about the minor appeal?? I haven't heard anything...will it not be decided later tonight? There are limited seats left on the Supporters Bus. Please contact me asap to book your space. Admin £10, optional £5 buy ins. Anyone heading to the fundraising dinner being run by Club Antrim? 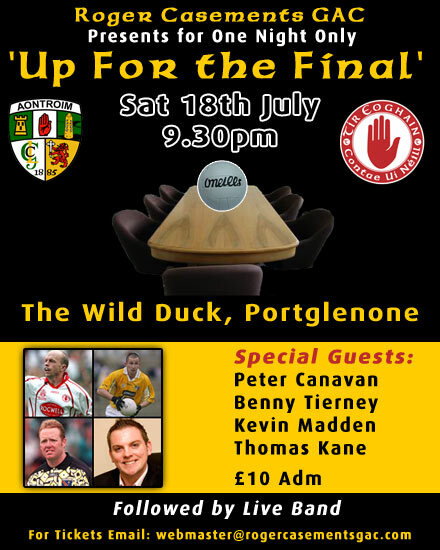 Looks like a good nights craic and all for a worthy cause! Sure to be a great nights craic! Well Done to all the Creggan Girls who were involved in the Ulster Championship Finals over the weekend! Great result against St Galls on Sunday... timing good in the run up to Championship! Good luck in the Championship lads. does anyone know anything about whats happening with the minor championship? No official word on this subject yet and it will not be discussed on this message board. Details will be released as and when they are known. Thanks for your patience. does anyone know when the date and venue be sorted for the senior champship? Just watched the Antrim / Cavan game last night. Great game, great result. Congrats to Peter and Dermot. Well deserved to two dedicated lads. Any fotos from the minor game las nite? Bus is first come first served.